The following brief descriptions of the properties was taken from the National Register, with emphasis on its history. To get a more complete architectural description along with sources cited, visit the Texas Historic Sites Atlas, a feature of the Texas Historical Commission website. Enter Fayette under "county search" for a list of all Fayette County listings in the National Register with descriptions and maps. 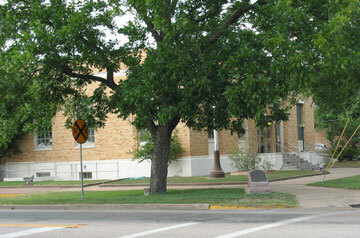 The Fayette County courthouse, dominating La Grange's courthouse square, is surrounded by two-story commercial buildings, typical of small Texas courthouse towns. A block from the square stands the picturesque 1881 Victorian Gothic county jail. Although the entire square is worthy of nomination, only the courthouse and jail will be submitted at this time. The Fayette County courthouse is a three-story masonry Romanesque Revival structure with a tall clock tower rising over the main entrance. Designed by J. Riely Gordon, the courthouse was built in 1890-91 and was a unique departure from the traditional cross corridor plan of Victorian courthouse designs. Inspired by a desire to develop good lighting and a more satisfactory arrangement for natural ventilation of interior spaces, Gordon arranged all the offices and the courtroom around a 30-foot square central courtyard. Numerous doors opened into this space, providing for cool breezes through the building. On the second and third floors, a two-story courtroom encompassed the west side. In the 1940's, due to a need for additional space, the open court was converted into a vault and offices. . . .
Texas' most abundant building material — stone — was used to create rich detail in texture and color. The exterior walls displayed Belton white limestone and Muldoon blue sandstone in a polychrome technique. The two stones produce a checker- board effect in the gables, while the arches are richly expressed by alternating the voussoirs with the two different stones. Red Pecos sandstone emphasized the horizontal string courses and pink Burnet granite richly accent the columns and steps. The colonettes display acanthus-leaf capitals and some of the stonework displays detail. Located at the base of the clock tower is a large stone slab on which an American eagle is carved. At each end of the dentil work above the stone slab are the likenesses of griffins. Between the windows the pressed tin swag and patera motifs in the spandrels further embellish the building. . . .
A block from the Fayette County Courthouse stands the two-story, Masonry, Victorian Gothic Fayette County jail. Designed by Andrewarthe and Wahrenberger and built in 1881 by Fritz Schulte, the picturesque T-shaped structure contains both jailer's quarters and cells. The building expresses a feeling of solidity in the use of rusticated limestone and emphasizes the architectural details with the smooth, polished stone. . . .
Fayette County was first settled by members of Stephen F. Austin's old Three Hundred. Named for the French hero of the U.S. Revolution, Marquis de La Fayette, the county was created by the Republic of Texas in 1837 and organized in 1838 with La Grange as the county seat. Several different structures housed the courthouse and jail before the present facilities were built. Because of the immediate need for a courthouse in 1838 a small building, formerly used as a grocery store, was moved to the square. Despite the lack of space, it was not until 1847 that a larger permanent courthouse was erected. Also built in 1838 at a cost of $460, was the county's first jail, in which prisoners were ironed and chained. However, within ten years a new building was needed. After numerous plans and appropriations an attractive two-story brick building 'was finally built in 1853. Fayette County citizens soon became concerned that the new brick jail looked better than the courthouse, thus a third courthouse was constructed in 1856. Built by H. L. Kreische and designed by William Rosenberg, the two-story masonry structure served the county until 1890. The 1853 jail was remodeled in 1876, but by 1881 the old jail had proven inadequate to detain prisoners. In 1881 the county commissioners selected the design of Andrewarthe and Wahrenberger for a new prison and received the bid of F. Schulte for its construction. The jail was completed in 1883 and the iron fence enclosed the grounds in 1884. By 1890 an examining committee reported that the third courthouse was in unsafe condition and recommended that a more substantial building be constructed. The county commissioners chose J. Riely Gordon of San Antonio as-the architect and Martin, Byrnes and Johnson of Colorado City as the builders. A native of Winchester, Virginia, J. Riely Gordon had no formal architectural training. At the age of 18 he began his career in Texas by study and apprenticeship with the Waco architect, W. D. Dodson. In 1883 Gordon went to Washington, D. C. and worked under the supervising architect of the Treasury. Returning to Texas in 1887 he opened an office in San Antonio and soon became popular as a courthouse architect. Besides the Fayette County Courthouse, he designed the courthouses in the counties of Victoria, Bexar, Earth, Dallas, Brazoria, Ellis, Hopkins, Gonzales, Wise, Lee, Comal and Harrison. Following a national trend inspired by the work of Henry Hobson Richardson the style, frequently known as the Richardsonian Romanesque was quite fashionable in Texas in the 1890's. J. Riely Gordon did some of his finest work in this style and most of his courthouses reflect his personal version of the Richardsonian Romanesque. The Fayette County Courthouse and Jail, both serving their original functions, remain unchanged except for some interior alterations. Henry Rhode constructed the Masonic Building in 1860 with Florian Meyer serving as contractor. Constructed of limestone blocks covered with stucco, it rises three stories and is crowned with a projecting stone cornice. Stone stringcourses delineate the floors that comprise the cubical mass of the building. The façade is simply composed of four bays with two doorways on the ground floor. Windows are 4/4 with stone sills and lintels on the first and second floors and casement windows on the third or attic story. Access to the upper floors was by an exterior staircase. In 1940, this stair was removed and replaced by an interior stairway. An exterior fire escape has since been added. Originally heated by a fireplace that is no longer functional, the exterior of the building retains a high degree of integrity. The building received the Recorded Texas Historic Landmark designation in 1962. After the death of Rhode in 1862, the La Fayette Lodge No. 34, A.F.&A.M. and the I.O.O.F. Lodge No. 30 purchased the building in 1866. 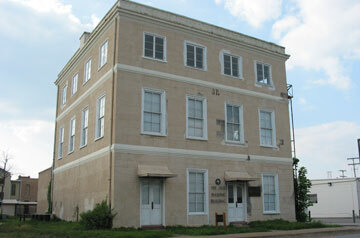 The Masonic Lodge occupied the third floor from July 24, 1866 to May of 1939. In 1871 the Lodge sold the property to J. M. Farquahar but continued to occupy the third floor. Upon the death of J. M. Farquahar in 1879, his two daughters, Mrs. T.S. Brown and Mrs. Robert McKinney held an undivided interest in the property. Mrs. McKinney’s husband, Dr. McKinney, served as the Worshipful Master of the Lodge. Upon the death of Mrs. McKinney in 1920, her half-interest was conveyed to her sister, Mrs. T.S. Brown. In 1939 the property was sold to William and August Hermes. Among the occupants of the building over the years were Joseph Brown, attorney (founder of the J. C. Brown Abstract Company, later known as the Fayette County Abstract Company), the National Farm and Loan Association, the Brenham Production Credit Association, the Soil Conservation Service. Fayette County Abstract Co. occupied the building from 1940 through 1973. In 1880, construction began on four identical buildings by four businessmen: Meerscheidt, Schuhmacher, Lidiak and Haye. Located along the northeastern extension of Colorado Street one block from the courthouse square, these buildings signaled the rapid commercial growth of the area. The building at 136 Colorado Street housed a cigar factory (1881-1883) and a succession of grocery stores (1883-1907). Purchased in 1907 by Frank Reichert, it was subsequently used as a furniture store. This brick, one-part commercial building is three bays in width. Originally, each bay contained an arched entryway flanked by paneled piers (visible in the adjacent building in the photograph). An ornamental inset panel above the archway further delineates the three bays. The building is crowned with a stepped parapet risting to a pediment. The building’s ornamental use of brick is characteristic of buildings within the historic district constructed during the late nineteenth century. In 1927, the building received a 62 foot extension to the rear and its storefront was modernized. Before this remodeling, the façade consisted of three arched entryways with a doorway within each bay. The new storefront featured modern display windows, a deeply recessed entry, marble kickplates, and multi-colored prismatic glass transoms. The building retains its original canopy. Formerly the site of McClatchy’s Livery (burned 1883), Axel Meerscheidt and John Schuhmacher purchased the property and began construction of a monumental brick building in the Italianate style in February of 1884. The two story, symmetrical façade is composed of seven bays with the center bay, serving as the entry to the second floor, flanked by stone pilasters. Stone pilasters also flank each side of the building. The arched windows and entries of the bottom floor frame multi-light, arched windows. A centralized stairway divided the ground floor into two separate storefront areas with offices located on the second floor. The two storefronts of the ground floor each contain three bays with a centralized entry. One of the original doorways remains while the other has been replaced with a modern, aluminum glass door. The windows of the upper floor are double-hung, 4/4 framed by a segmental brick arch with stone sills. Four fireplaces, two on each floor, were located towards the rear of each exterior wall. A prominent bracketed cornice crowns the building. John Wertz, a local tinsmith, executed the ornate iron cornice. According to local newspaper accounts, “Mr. Meerscheidt deserves much credit for the taste and liberal expenditure made in securing a cornice so handsome.” The building was completed in October of 1884. The post office occupied the east half of the first floor until 1906. The other side of the ground floor was first occupied by P.T. Carter’s Jewelry Store, but the First National Bank took its place in 1892. Occupants of the upper floor included Dunn, Meerscheidt, Robson and Rosenthal, attorneys; Mauer and Wesling, architects; G.A. Hall, cotton buyer; and Dr. Otto Ehlinger. The second floor contained a fireproof vault from the Herring Safe Company. The Hermes family acquired the building in 1893. It was sold to the First National Bank in 1986. This corner lot was the site of numerous businesses since the 1880s including a blacksmith shop, an automobile company (L.G. Auto Co.), and the first automobile garage in the city (City Garage and Sales Co.). By 1921, however, it was a vacant lot. The current building was constructed in 1927 and served for more than forty-five years as the offices of the Ehlers Cotton Company (1927-1972). From 1974 through 1977, it was occupied by the Abstract Land Title Company. Unlike many one-part commercial buildings which typically serve a retail function, this building served as an office building. Alfred Ehlers (1896-1973), a graduate of Texas A&M, served as one of the leading cotton merchants in the county. He was instrumental in forming the Old Cotton Belt Association which encouraged increased cotton production with better prices for local farmers. Involved in many civic enterprises in La Grange, he established the booster La Grange Quarterback Club, served on the City Planning Commission and the Chamber of Commerce, and contributed to both the American Legion and the Veterans of Foreign Wars. The local American Legion is named in his honor. Ehlers also lent a portion of his building for use by the Salvation Army. The small cubical mass of this modest brick and stucco building is divided into three bays with a centralized entry of two double doors with transom. Two pairs of wooden, double-hung 2/2 windows flank the doorway and are separated from the upper part of the building by a simple stringcourse. The upper part of the building includes three rectangular panels, the center of which contains a nameplate (the sign for the current business covers the original nameplate). A modest, slightly projecting coping caps the building. The Ehlers Cotton Company building looks today exactly as it did when it was constructed including the green paint on the doors, windows, and trim. A mural of foliage was recently painted on its northern side wall which in no way affects the historic integrity of the building. Founded in 1855 and originally located on the northeast corner of the square in a primitive log building, this drug store moved to several locations until the present building was completed in 1907. Established by William Hermes Sr. of Heidelberg, Germany, a graduate of the University of Heidelberg, he offered the community a wide range of services beyond drugs including subscriptions for newspapers (from New Orleans, New York and Galveston), school books, sundries, hardware, and groceries. In 1865, Dr. H.A. Eck became his partner. The yellow fever epidemic of 1867 killed Hermes’ entire family and blinded Dr. Eck. Hermes fled to South America returning in 1868. He married a second time in 1868 to Lesette Holste and had 4 children (William Jr., August, Auguste, and Louisa). Both sons attended pharmacy school, and in 1890, William Jr. took over the drug store as sole owner. In 1927, William Jr. sold one-quarter interest to his brother August and one-half interest to his son, Gilbert. The two men became equal partners in 1930 when William Jr. sold the remaining one-quarter share to his brother. At his death in 1940, August Hermes willed his interest to his nephew, Gilbert, who became the sole owner. In 1946, the store was sold to Edgar Anders. The records of the Hermes Drug Store survive along with early pharmaceutical equipment at the San Jacinto Museum. In addition, other artifacts from the drug store are housed at the Fayette Heritage Museum and Archives. The Hermes family owned several store buildings located on the square. In 1906, under the ownership of William Hermes Jr., the store moved temporarily to the Lester Hotel while a new two-story building was under construction.The Old Palace Saloon (1884) was integrated into the right side of the new building. Completed in 1907, this building is constructed or red and cream colored cast stone imitating the appearance of rusticated limestone. A series of attenuated arches define the ground floor shop windows and entries to the second floor offices (The Hermes Drug Store occupied the three arches on the left of the façade). The second floor features seven bays of segmental arched windows (double-hung, 1/1) separated by engaged pilasters but united by a continuous stringcourse. The building is crowned by a cornice and scalloped parapet with the name “Hermes” inscribed in relief. The polychromatic effect and Romanesque Revival style of the building echo that of the Courthouse across the street, demonstrating the affect of the courthouse design on buildings constructed almost two decades after its completion. The building retains a high degree of integrity including one of its original recessed entries, transoms above the ground floor windows, and kickplates for the display windows. The two arches on the right of the window have been combined into one display window, a historic change to the building. Constructed at a cost of $54,500, it was completed in February of 1937. James Farley served as Postmaster at the time of construction. Designed by the U.S. Supervising Architect, Louis A. Simon, the La Grange Post Office is typical of depression era post offices. Designed according to a standardized plan, the one-story building includes a basement and a loading dock on the rear. The front façade is composed of a tripartite entrance in addition to a multi-light window bay to each side. The entrance is composed of a centralized door flanked by multi-light windows with three ornamental panels inserted above the doors and windows. These cast stone bas-reliefs illustrate the three modern methods of transporting the mail: from left to right they depict a train, plane, and ship. The window on the east has been converted into a doorway to provide for handicapped access into the building. In addition, a ramp leading up to this doorway has been installed. The only ornament on the building consists of cast stone spandrels between windows and a cast stone molding near the cornice. The entrance to the post office is flanked by two light standards in the Moderne style. The interior of the post office retains most of its original features including a wooden foyer. The only changes are the fluorescent light fixtures, acoustical tile ceiling, and the addition of new mailboxes in the lobby. A mural executed by Tom E. Lewis in 1939 hangs on the east wall of the lobby. Unlike many such murals which depict a regional scene or a historical event, this painting depicts horses grazing in a field and is simply entitled “Horses”. The mural is now framed independently of the wall and is in bad condition. A granite marker bearing a bronze medallion, located at the corner of East Colorado and Franklin, commemorates the first U.S. rural postal route in Texas. Erected in 1936 by the State of Texas and the Fayette County Rural Letter Carriers Association, this marker is a contributing feature within the district. 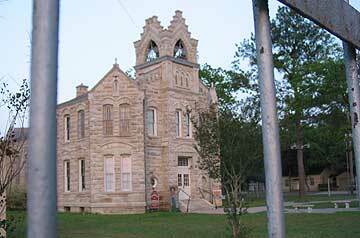 La Grange first received mail service during the Republic of Texas era in 1838. By 1840, four of the 36 mail routes in Texas moved through La Grange. Swante Palm served briefly as postmaster from 1848 to 1850 as did William Hermes, who served from 1866 until 1874. During the term of Herman Heileg (April-December, 1899) the first rural mail route in Texas was implemented in the La Grange area. This route covered 23 miles and served 685 people. The post office was generally located in the business establishment of the postmaster, thus there were many locations over the years including 129 West Colorado (1884-1906) and 135 West Colorado (1906-1936). City delivery was not implemented until 1949 at which time it was necessary to establish house numbers throughout the city. The original passenger depot, constructed in 1887, was destroyed by a fire in 1897 which began in the city hall located in the same block at 252 N. Washington. This depot was constructed according to standardized plans utilized by the railroad. Located parallel to the tracks, the building reflects the influence of the Stick style with its decorative use of both horizontal and vertical boards, as well as a herring-bone pattern in the gable areas with a louvered window. The base of the building is composed of vertical boards with paneled areas of varying size and painted in a contrasting color. The southwestern elevation features canted walls at the gabled end and a tripartite arrangement of windows with the sign announcing the passenger’s destination point. All windows are original and feature wooden, double-hung 6/6 windows arranged both singly and in groups. The gabled roof has wide overhanging eaves supported by a multitude of graceful stick brackets. The elevation facing the tracks features a projecting bay window. The rear of the depot served for the storage of luggage and retains all of its original features including the cargo doors. The building retains much of its original furnishings and all of its interior beaded board paneling as well as its five panel doors. Interior window moldings feature a bull’s eye pattern. Originally heated by two chimneys, these were late replaced with pot-bellied stoves during the historic period. The segregated configuration of the interior floor plan is still apparent. In March of 1911, President Theodore Roosevelt spoke briefly at the depot after the City Council passed an ordinance making it illegal for a president to pass through town on a train without stopping (President Roosevelt was informed of the ordinance). In 1939, the cost of a ticket from nearby Fayetteville to Houston cost $2.55. The depot continued to serve the community until after World War II when passenger service ceased. Since that time, the building has been used by various businesses since its closure including a florist shop, art gallery and video shop. The La Grange Chamber of Commerce purchased the building in 1981 and restored the old depot including repainting it to its original colors and repairing the slate tile roof. The Chamber of Commerce moved to the Old Jail building in 1991, but continued to lease the building to area merchants. 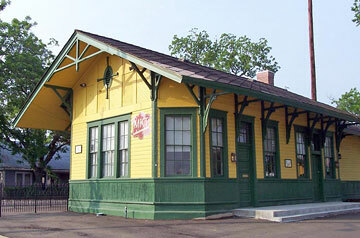 In 1999, the Friends of the Depot purchased the building and Department of Transportation T-21 funds were secured to restore the building for use as a railroad museum. Constructed between 1890 and 1891 by San Antonio architect James Riely Gordon, the Fayette County Courthouse is an outstanding example of the Romanesque Revival style in Texas. 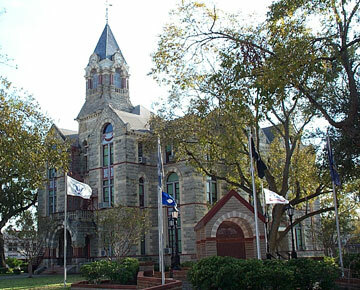 Martin Byrnes and Johnson, contractors, received the contract for the construction of the courthouse for $82,750, although the final cost was $95,646.39. This three story masonry building faces east with a 100 foot clock tower rising over the main entrance which also features a bas-relief eagle with spread wings at the base of the tower. Secondary entrances are located on the other three sides of the courthouse. The side and rear elevations are similar in massing with a five-part composition of a central entrance bay flanked by two projecting gabled pavilions and recessed, crenellated end sections. Yet, Gordon subtly varied these elevations to add variety and richness while simultaneously presenting a unified design. Gordon utilized richly colored masonry in his polychromatic treatment of the facades including white limestone from Belton, blue sandstone from Muldoon, Red Pecos sandstone and pink granite from Burnet. Typical of the Romanesque style are the inclusion of a checker-board pattern within the gables, colorful colonettes supporting arches, balconies, and ornamental flourishes of griffin-like gargoyles. A hipped roof, orginally slate and red tile, is now covered with composition shingles. Arranged around an open, central courtyard to provide maximum ventilation and natural lighting, the plan of the courthouse represents an innovative departure from the typical cross-corridor plans of earlier courthouses. A two-story courtroom with a spectator's gallery occupied the second and third floors of the west side. The courtroom is virtually unchanged. The Fayette County Courthouse is the second of sixteen courthouse designs by renown Texas architect James Reily Gordon and represents an important early stage in his development of a cruciform plan. This courthouse is the fourth for Fayette County. The courthouse has received very few alterations over the years. 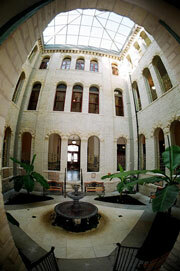 The interior courtyard was enclosed in 1949 to provide additional office space and a vaault for county records. With the addition of air conditioning, the courtyard no longer served its original purpose. Several changes were made in the 1920s including the removal of the acorn-shaped ridge points (1925) which were falling from the roof and the removal of the chimneys (1927) as steam heat was provided to the building. In 1951, the Seth Thomas clock was converted to electric from its original hand-wound mechanism. In 1953, the iron deer received new antlers after it was vandalized. The Kreische Brewery, the first commercial brewery in Texas, constructed in the 1850's, and adjacent Kreische House, a German Colonial limestone structure, constructed from 1836 through 1856, were both built by Henry Ludwig Kreische. Kreische was one of the earliest settlers in this area of Texas, immigrating from Saxony in the early 1830's, and bringing with him not only the skill of an excellent brewmaster, but also that of an artisan in stone. From his own quarry, Kreische handcut limestone for the construction of his brewery, house, statuary, retaining walls, and steps around the grounds, connecting the house and the brewery. The brewery is located 300 feet from the house in a protected canyon, where a spring trickles from the limestone into a collecting pool and filtering system for the water used in brewing. A stone cistern and grist mill were near the collecting pool, with a series of intricately laid stone stairs leading down to the aging room. The aging room is a forty by twelve foot room with a ten-foot barrel vaulted ceiling. The remains of a stone partition wall are visible, and all the walls and ceiling were once covered with plaster, most of which has now fallen off. Evenly spaced along the walls are rectangular vents used to drain water from the cistern which dripped through the ceiling and over the kegs to keep them cool. Ducts leading from the ceiling to the outside served as ventilation. Near the aging room is a grotto cut out of the rock hillside that was used for the storage of kegs after they had aged and were ready to be shipped. Between the grotto and the aging room is a stairway leading to the roof of the aging room where the boiling vats were located. All that remains in this room is the iron bracing used in suspending the vats over the fires. Also on this level are the external ports for the aging room air vents. The walls still standing of the boiling vat room show the positioning of windows and doorways with arched lintels of individually wedged small stones. Throughout the brewery are numerous niches in the stone walls probably used for storing instruments and tools. A lime kiln, near the main structure, is about fifteen to twenty feet high and would have been adequate to supply lime for plaster and mortar used in great quantities throughout the building complex. There is evidence of a two room stone building half way up the hill leading to the Kreische House. It is quite likely that there were several out structures in this operation, such as a copper shop, blacksmith shop, and storage buildings. A newly found slab is under excavation nearby. Up the hill from the brewery is Kreische's house, high on a bluff overlooking the Colorado River valley and the town of LaGrange, Texas. The fourteen-room, split-level building has a two-story front, facing the river; a three- story rear faces the brewery. The oldest section of the house, the west wing dated 1836, consisted of three lower rooms and a large room with a fireplace above. Stone stoves were built into the walls in two of the lower rooms which were used for cooking and eating space. The third room downstairs, with its vaulted ceiling and five foot thick walls, served as a storage room for the food and drinks, as well as a center for defense. Later expansion of the house, having a cornerstone dated 1856, saw the addition of a large dining room adjacent to the kitchen area on the lower floor. This room was used mainly for entertaining and has stone seats, cantilevered from the walls, around the room. Kreische had niches built into the walls with statuary, now missing, at various points around the room. Off the lower dining room is the master bedroom, completing the addition to the lower floor. At the same time the lower additions were made to the House, a spacious, high-ceilinged living room and a bedroom were built upstairs, in what is the first story of the front or north facade. The living room is now used as the main exhibition area for a collection of early Texas memorabilia. Both the upper and lower back galleries, on the south side, present a view of the valley in which the brewery is built and the stream carrying the spring water. On the upper gallery is a hand-hewn rain gutter made from a single log. At the west end of the back porch is the top entrance of a copious masonry cistern which is two stories high, having its base located next to the old kitchen. A narrow set of stairs leads up from this gallery, along the east wall, to the attic or garret bedrooms which are now used for storage. On the lower gallery is an array of meat hooks protruding from the rafters, where the butchering took place. When Kreische enlarged his house, he planned ahead for further expansion by leaving notches in the loadbearing east wall. Triangular notches above the lower story windows were to accept lintels, allowing for the windows to be converted to doors. The squared notches were to receive ceiling and floor joists for the expansion. The exterior staircase to the garret bedrooms would have become an interior stairwell with the addition to the east. All of the stone walls were intended to have plaster over the rubble finish, but the east wall and most of the north facade were never finished. The west (oldest) wing of the house was plastered and scored to resemble dressed stone. The present roof, of corrugated tin on the north side and composition shingles on the south side, has been applied to the original roof of free-split cedar shingles which is still intact. Two dormers protrude from the steeply pitched roof on the south side, illuminating the garret bedrooms with 6 over 6 sash windows. The lower stories on the south side have 9 over 6 sash windows, as does the lower story on the north side. The central bay of the north facade has 6 over 6 double sash windows symetrically flanking a triple sash, 6 lights per sash, central window. The central doorway, below, is segmentally arched with double doors. Five limestone chimneys, located about the perimeter of the newer, main body of the house, provide heat for the building. Air vents at floor level were incorporated under the second story window sills on the north and east walls for circulation of air, causing the air currents coming up the bluff from the river valley below to flow through the house. Twenty yards from the back of the house stands Kreische's smokehouse of small rubble limestone chinked with ash and lime. Inside, the cedar rafters, stone shelves, and plastered walls are black with a coating of carbon. Just outside its front door is a wooden trough for scalding hogs, and fifteen feet away is an oval picnic table 3 feet by 6 feet, carved from a single slab of limestone. A hundred feet from the house stands Kreische's wagon barn, the loft of which was used as sleeping quarters for brewery workers. Near the wagon barn is a small cedar log cabin with an end wall chimney. The chinking between the undressed cedar logs has been replaced recently, as most of the structure has been reworked. The Henry Ludwig Kreische Brewery and House is an example of early central Texas industry, as well as an example of a stone building technique of the highest caliber. The Kreische Brewery and House epitomize the ingenuity and industry, as well as the consummate craftsmanship, brought to Texas by many immigrants in the statehood period before the Civil War. H. L. Kreische built the first commercial brewery in Texas. Construction began in the 1850's, and he was producing beer before 1860. His beer was exported to places as far away as Ft. Worth and San Antonio under the banner of "Frish Auf" meaning refresh or freshen up. 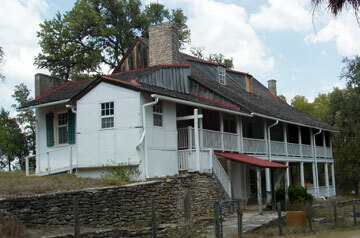 Kreische came to Texas via Galveston in the early 1830's and settled in LaGrange on what is now called Monument Hill. He had been educated as an architect in Austria and was an expert brewmaster well. Kreische built many fine structures in Fayette County among which are the Catholic Church in Hostyn, and LaGrange's first jail and second courthouse. The stone used in the original monument, erected to the memory of the Dawson Company and Mill Expedition, heroes in the Texas struggle for independence from Mexico in 1842, was cut by Kreische. He also provided the land where the present monument now stands, just 200 feet from his house. Supplementary to Kreische's activities as a brewmaster and builder, he and his family raised cattle and ran a ferry across the Colorado River a mile upstream from his house. The ferry service, which was discontinued in 1890, was instigated mainly for the convenience of distributing beer to LaGrange, but he also shuttled people and their produce across the then bridgeless river. Kreische's Brewery prospered until the introduction of an ice-cold beer from St. Louis. Refusing to bend to popular tastes, his business dwindled. Kreische died in 1882 and his family closed the brewery in 1888. His children, three boys and three girls, never married and all remained living in the house until their deaths. 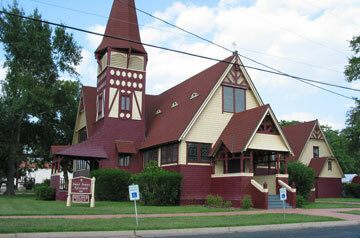 Saint James Episcopal Church in La Grange, Texas, is locaed on the southeast corner of Monroe and Colorado Streets. The present structure was built in 1885 and has been meticulously maintained since that time. Built as the first permanent home for the parish, the structure represents an outstanding architectural example of the Stick Style. The architect for the project, Richard M. Upjohn of New York, was the son of Richard Upjohn, Sr., founder of the American Institute of Architects and renowned designer of Episcopal churches. The exterior of the building is dominated by the bell tower which occupies the corner formed by the intersection of the nave and north transepts. Two stories in height, the lower structure of the tower is defined by shingle-covered walls on the first story with a half-timbered effect at the second level. The porch on the north side of the tower is embellished with a shingled wall to a height of four feet with turned spindles and chamfered brackets above supporting the shingled roof. The gently sloped porch roof is an extension of the shingled tower wall and curves outward on the ends. Clapboard siding on the faces of the second level are interrupted at regular intervals with diagonal bracing in a half timbered manner. Small windows of leaded stained glass grace the center of the facades of the tower. Above the windows are decorative panels with foil motifs. The belfry is defined by fixed louvers on the four sides with ornate brackets in the center for support of the projecting octagonal spire. The tall spire is terminated by a crucifix whose ends display fleur-de-lis motifs. The facades of the building are encircled to a level of six feet with shingled wainscoting. The ends of the north and south transepts are dominated by steeply pitched gables whose upper sections display decorative bargeboards with diagonal bracing. The ridge of the gables are dominated with pendant and finial motifs. Stained glass windows are arranged in five-over-five panel configurations. Similar windows are arranged horizontally in groups of three along the north and south walls of the nave. The west facade is similar to those of the north and south transepts with the exception of a projecting entrance porch. Shingled wainscoting extends to a height of four feet on the north and south sides of the porch with turned spindles and chamfered bracing supporting the steeply pitched roof. The roof of the building occupies a vast area of the exterior surface and is relieved at regular intervals with eyebrow dormers. An addition to the south transept was constructed ca. 1940 to accommodate the Sunday School. A diligent effort was made to conform with the proportions and detailing of the original structure. The interior of the church reinforces the picturesque quality of the exterior. A central aisle terminates at the crossing of the north and south transepts with the altar projecting into an apse beyond. Exposed structural columns and trusses are constructed of East Texas yellow pine and create interesting geometrical patterns along the ceiling. White plastered walls and ceilings offer a strong contrast to the heavy exposed beams and trusses. A heavy cornice above the horizontally spaced stained glass windows is embellished with circular molded motifs. The original pews are also built of yellow pine and stained to maintain the natural beauty of the material. The congregation of Saint James Episcopal Church in La Grange is the only organized group of the denomination in Fayette County and has enjoyed a colorful history since its founding in 1855. The present building in which the congregation worships was designed in 1885 by Richard M. Upjohn, the son of one of the most prominent architects of the 19th century. Significant not only for the role the parish has played in the social and cultural history of the county, the church also represents an outstanding architectural example of the Stick Style. The congregation of Trinity Parish was formed on August 18, 1855 with the Reverend Hannibal Pratt as minister. Reverend Pratt was engaged to preach once each month in the community and continued this practice until his death on December 11, 1857. During 1858 the spirit of the church was kept alive by a Sunday School which met either in private homes or the court house. The year 1860 was marked by the visit of Bishop Alexander Gregg to the parish and the confirmation of four new members. It was during this period that the name was changed to Saint James Parish. The congregation grew in membership during the years 1860 to 1876 and included as its parishioners some of the most notable citizens of the community. Services were led once each month by an ordained deacon from Columbus, thirty miles to the east. In late 1876 the parish had grown to the extent that a rector was summoned for two Sundays each month and the first permanent home was purchased. An old school building was adapted by the congregation under the leadership of Reverend N. G. W. Smith. A native of New York, Reverend Smith had moved to Texas to establish a mission there. By 1885 the congregation had outgrown the schoolhouse and established a fund to build a new church. Reverend Smith used his social connections in New York to solicit funds and the aid of Richard M. Upjohn, the son of the renowned ecclesiastical architect of the mid-19th century, Richard Upjohn, Sr. The cornerstone of the present building was laid on February 5, 1885, with many officials of the Protestant Episcopal Church in attendance, Reverend Smith employed his carpentry skills to construct the altar, Bishop's chair, lectern, and communion rail in the church, all of which are intact today. Other features of the building which are attributed to Reverend Smith's decision are the design of the windows and the crucifix on the belfry. The construction of the building was conducted by Mr. C. Michael's, a local carpenter who also constructed the original pews. The church exists today as one of the finest examples of the Stick Style to be found in Texas. The original colors of dark red, ivory, and brown have graced its walls since Consecration Sunday on February 28, 1886. The only changes to the facility, a new hardwood floor and asbestos shingle roof, were installed in 1964. The State Highway 71 Bridge at the Colorado River was built from 1940 to 1941. This custom-designed Parker through truss bridge with five spans and special decorative features is significant for embodying the defining characteristics of a THD truss bridge. As such, the bridge meets National Register Criterion C in the area of Engineering at a state level of significance. The Colorado River bridge in Fayette County was built on SH 71, which originated in Austin and extended southeastward towards the Gulf Coast through Bastrop, La Grange, Columbus and El Campo. THD constructed the Colorado River bridge to replace the previous bridge damaged by heavy floods on July 27, 1938. THD inherited the old bridge, built by the county in 1884, when it designated the route a state highway in 1917. The old bridge accommodated a 17-foot roadway . . . . The existing Colorado River Bridge was constructed by Fayette County in 1884, and has received numerous repairs by the Highway Department since that date. On July 27, 1938, during high water, an 80' section of this structure collapsed. This section was temporarily repaired by the maintenance forces, and consisted of 2-40' I-Beam spans on treated timber pile bents. It was realized that this was only a temporary repair and that the service of this structure was limited. A request was made to the Public Roads Administration for a Federal Aid Project, covering the construction of a new bridge, to cover the construction of a new bridge, using emergency relief funds. This project was approved and has been placed on the [Emergency Relief] Program. (1) The Highway Engineer would recommend to the Commission the approval of the route crossing the Colorado River near the present bridge and intersecting Travis Street west of Water Street and proceeding thence along Travis Street to the crossing of the T&NO Railway. The probable future route from this point would be down the south side of the MK&T Railway to a point southeast of the present underpass. The Highway Department would construct the River Bridge and other necessary construction to connect with the present highway on either side of the River. (2) The City of La Grange would agree to construct pavement not less than forty feet in width at their entire expense extending from the intersection of the relocation with Travis Street and thence along Travis Street to Lester Street. (3) The City of La Grange would agree to take proper steps to accomplish the removal of the T&NO Railway tracks now crossing State Highway No. 71 at or near Lester Street. (4) The City of La Grange would agree to pass necessary ordinances and to enforce such ordinances requiring parallel parking along Travis Street throughout its length. (5) The City of La Grange, the County of Fayette and other interested parties should signify their understanding that if this route is constructed at the present time, it does not mean a commitment by the Highway Department as to the permanency of such route. Present indications point to the possible development of a complete route around the town of La Grange at such date as traffic may require same. This should be understood definitely by all parties concerned. On September 13, 1939, the La Grange City Council unanimously passed a resolution agreeing to the points outlined above, indicating the importance of keeping the route through the heart of downtown. Planning for the replacement bridge proceeded, with its location set at the end of Travis Street, but slightly shifted to the north of the existing bridge in order to keep it open to traffic during construction. Due to the large volume of present traffic and the possibilities of increased traffic, it is recommended that the roadway width of the structure be 26' . . . and, due to the possible increase in pedestrian traffic as a result of the suburban improvements, west of the river, and due to the fact that the structure is near the urban area where sightseers might congregate on the structure during overflow periods to watch the water, it is recommended that a sidewalk of sufficient width be constructed on the outside of the bridge proper; that this sidewalk be constructed on the upstream side of the bridge in such a manner that pedestrians will not cross from the sidewalk to the roadway. BPR engineers inspected the site and pointed out that if a sidewalk was provided on only one side of the bridge, some pedestrians would be forced to cross the road, producing a hazard at each end of the bridge. After much discussion between THD and BPR engineers, they agreed "that provision be made in the design for the installation of a similar sidewalk on the downstream side of the structure when pedestrian traffic warranted." To date this bridge remains with only its original walkway on the upstream (north) side. Rather than use a standard design, THD bridge engineers specially designed the 200-foot riveted Parker through truss spans for use on the replacement bridge. Nine other Parker truss bridges that THD specially designed survive today. The State Highway 71 Bridge at the Colorado River is one of only two bridges with five truss spans surviving on a Texas state highway. As part of an effort to improve the aesthetics of bridge design, particularly for structures in or near urban areas, several decorative elements were incorporated into the design of the Colorado River bridge. The bridge substructure exhibits arched concrete bents and concrete piers with beveled copings. In addition, decorative steel railing flanks the 3½-foot wide pedestrian walkway. The posts are made up of H-beams placed vertically, then cut, bent and welded to form the curved top end of the post. The top handrail consists of 3-inch piping. Below, two rows of channels between the posts face down. Small square steel pickets hang from the pipe handrail to fill out the railing. These pickets run through holes in the three rows of steel channels and are welded in place. The result is an elaborate and labor-intensive decorative steel railing. This is the most decorative type of steel railing used on THD bridges. The Colorado River bridge is one of only three surviving THD truss bridges exhibiting a pedestrian walkway with this type of decorative steel picket railing. In the meantime, THD engineers had applied for federal emergency relief funds from BPR to cover the cost of constructing a new bridge. The application covered two additional bridges destroyed by the July 1938 flood, including the Colorado River Bridge in Lampasas County (refer to nomination of US 190 Bridge at the Colorado River, LM0272-05-023, NRHP 1995). On November 28, 1938, BPR approved the use of emergency relief highway funds provided for under Section 3 of the Hayden-Cartwright Act of 1934. In addition to extending federal relief funding established under the National Industrial Recovery Act, the Hayden-Cartwright Act provided emergency funds for the repair or reconstruction of highways and bridges on the federal aid system "which have been damaged or destroyed by floods, hurricanes, earthquakes or landslides. . . ." The approval granted $367,500 to cover 50 percent of the estimated construction cost for these three bridges. The cost of constructing the new bridge over the Colorado in La Grange was estimated at $370,000, with $185,000 to be covered by the federal funds. The Texas Highway Commission held bidding for the Colorado River bridge in June 1940. After reviewing the six bids received, the commission awarded the contract to the Austin Bridge Company of Dallas. The company's low bid of just over $269,000 was substantially lower than THD's estimate. The Illinois Steel Bridge Company of Jacksonville, Illinois, fabricated the steel truss span; the Mosher Steel Company of Houston manufactured the pedestrian railing. At pier No. 3 consideration was given during this inspection to the desirability of lowering the footing grade some 2' or 3' below plan grade in order to place this pier deeper into shale and avoid possibilities of future scour. The construction methods used, however, were such that the proposed lowering would endanger the entire cofferdam due to the fact that the cofferdam had "blown in" and was in danger of additional "blow ins" if the footing was deepened. It was therefore concluded that the best procedure would probably be to place the pier at plan grade and provide rip-rap around same to prevent scour. It is contemplated that a large quantity of rip-rap material can be produced on removing the concrete girder spans of the old bridge and also that rip-rap material may be obtained from the present rip-rapped bar under the old bridge. The use of the available rip-rap material around the piers of the new bridge is recommended. The bridge was completed on August 15, 1941, at a cost of just over $279,000. In 1991, THD completed the outer loop of SH 71 that circumvented La Grange to the north. The original roadway was retained as the business loop of SH 71. This configuration lightened the traffic burden on the bridge, allowing for its preservation in place. To get a more complete architectural description of all these properties along with sources cited, visit the Texas Historic Sites Atlas, a feature of the Texas Historical Commission website.